Pretty soon, SOS readers are going to have to carry out extensive auditions if they want to assemble a virtual band. 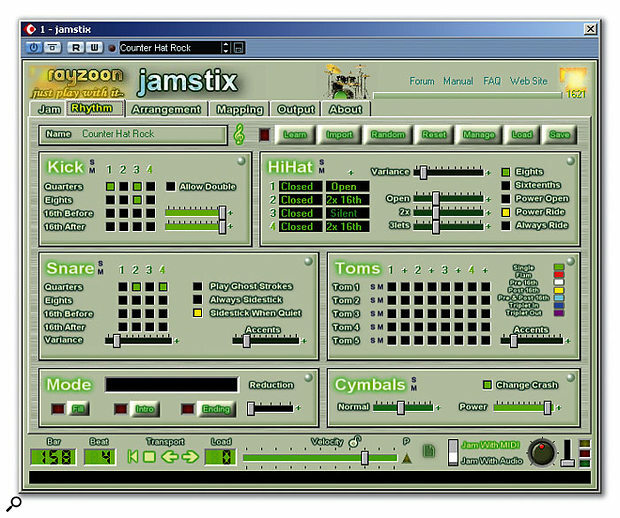 The most recent candidate for the electronic drumstool is Jamstix from Rayzoon, which approaches the virtual drummer idea from an interesting angle, the unique feature being its ability to jam 'live' with either a MIDI or audio input, responding to what you play in the same way that a human drummer might. Rayzoon have (thankfully) failed to replicate some of the other behaviours normally associated with real drummers — but just how good is a Jamstix jam session? 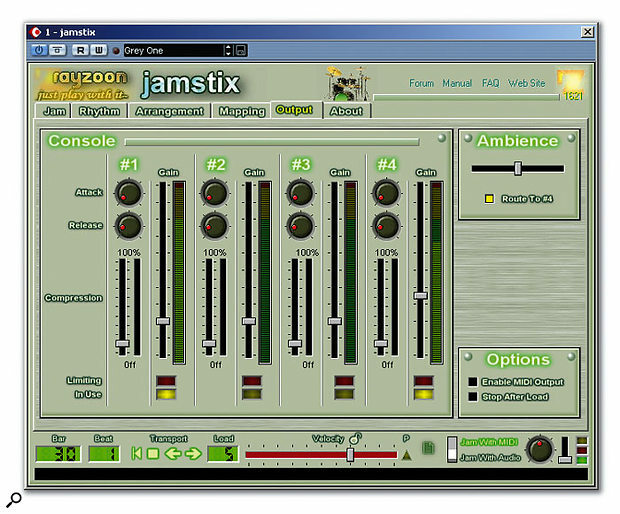 Jamstix is available for on-line purchase directly from the Rayzoon web site and although it has been tested with a wide variety of hosts including Cubase SX, Sonar, Ableton Live and Tracktion, Rayzoon advise potential purchasers to download the demo version prior to purchase. This has a number of limitations compared to the full version, such as random audio dropouts, but does allow for compatibility testing within a user's own system. You will need a broadband connection, as Jamstix is a large download. Installation proved straightforward on my test system, and Rayzoon supply a licence key via email once a purchase has been completed. Within a couple of minutes, I was up and running with Jamstix within Cubase SX. Jamstix includes a high-quality set of drum samples, featuring up to nine velocity layers and both close (mono) and ambient (stereo) mics that can be blended to taste. The range of drum kit styles is not extensive, perhaps suiting pop, rock and funk genres best. However, Jamstix provides a variety of ways to route its playing to alternative drum modules such as Steinberg's Groove Agent, Toontrack's DFH or FXpansion's BFD to trigger a different set of sounds. Jamstix also includes a large collection of drum patterns, intro, fills and endings to suit a range of styles. These do perhaps not cover such a wide musical territory as those found in Groove Agent but, as we'll see, a key feature of Jamstix is its ability to introduce a range of variations to those patterns much like a real drummer would do. Aside from the ability to jam, other features include a 'limb priority control' algorithm that means Jamstix will only attempt to play a combination of drums that is physically possible for a real drummer and an Arrangement screen that allows patterns to be sequenced on a bar-by-bar basis in much the same way as audio or MIDI loops might be within a sequencer application. Pentium III or Athlon 500MHz CPU (2GHz+ recommended). Windows XP or 2000 (Windows Me and 98SE are not supported but should work). 500MB free hard drive space. 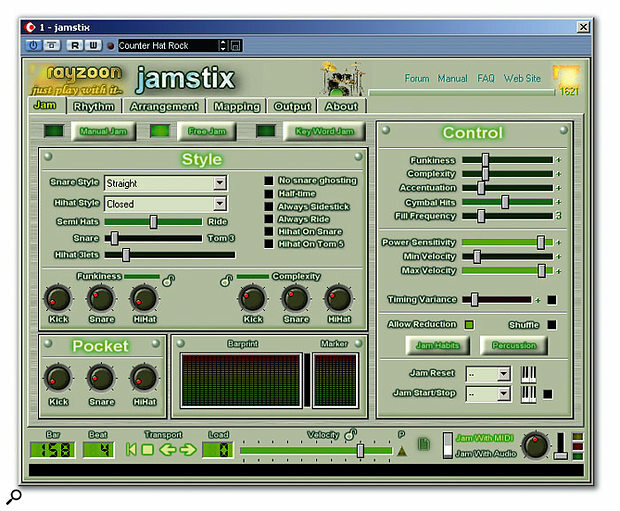 As shown in the various screenshots, the Jam, Rhythm, Arrangement, Mapping and Output tabs hide the large number of features hidden under the Jamstix hood. Three 'jam' modes are provided: Manual, Free and Keyword. In Manual mode, the Play Input button allows Jamstix to be played via a MIDI keyboard like any other drum module. Alternatively, any of the preset rhythm patterns can be loaded via the Rhythm tab and sequenced via the Arrangement tab; a maximum of 16 patterns can be loaded at any one time, although for reasons described below this is not as restrictive as it might sound. Intros, fills and endings can also be set within the Arrangement screen, so complete drum sequences can be built from scratch. Individual patterns can be customised within the Rhythm screen. Things get further off the beaten track in Free Jam mode. With Free Jam selected, Jamstix will, in essence, make up its own drum patterns on the fly and will adjust its playing to match aspects of your own playing, either in response to MIDI or audio input. Both can be live or from a pre-recorded track and a second AudioM8 plug-in is supplied. This is placed as an insert on the required audio track and routes the signal to Jamstix. With an audio input, Jamstix responds to the changes in volume (velocity) of the signal, playing more busily and louder at higher input volumes. With a MIDI input, the velocity response is similar but the rhythmic and harmonic content are also used to introduce some variations to the drumming. At the same time, the Style and Control settings can be adjusted to introduce all sorts of random variations much as a real drummer would. For example, the degree of Funkiness, Complexity and Accentuation can be adjusted within the Control section. The freshly created patterns are automatically placed within the Arrangement screen, so if you create either individual patterns or sequences that hit the spot, these can subsequently be fine-tuned and re-sequenced by switching to Manual mode. The Arrangement screen does exactly what it says on the tin. Key Word Jam allows the user to pre-select a number of the built-in rhythm patterns on the basis of key-word descriptions. These patterns are loaded into the Arrangement screen and can then be arranged in Manual mode; alternatively, Jamstix can arrange them automatically in response to a 'jam' against the audio or MIDI input as in Free mode. Again, the Control options allow the degree of variation around these patterns to be set. My initial 'jamming' felt a little clumsy: Jamstix varied its volume too much and its playing became both too busy and too loud at high input volumes. It took some time experimenting with the various controls to gradually achieve what I was after. 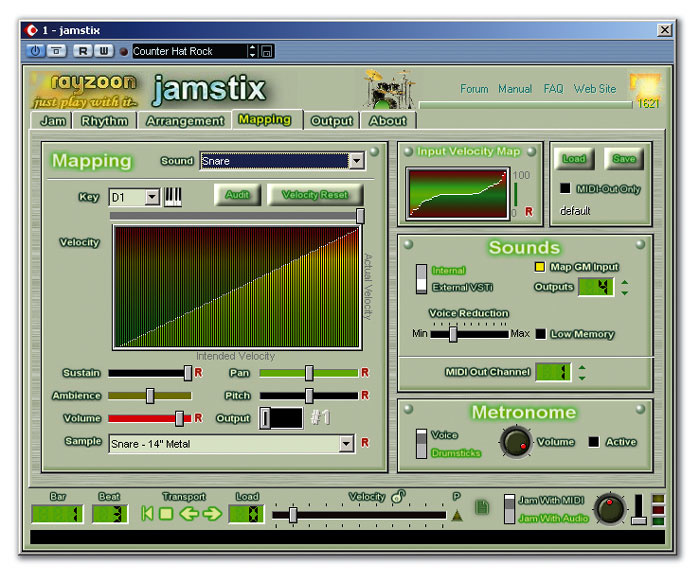 There are aspects of the user interface and the manner in which Jamstix functions that are a little quirky, but it is certainly worth persevering: for rock, blues and funk styles, some of the results were truly excellent. The sensation of having a virtual drummer respond to the dynamics of your playing is quite remarkable, and Jamstix throws in some genuine surprises that are very un-machine-like. Jamstix also boasts plenty of other control options, some of which are worthy of particular mention. For example, the Arrangement screen is very straightforward to use, and right-clicking on a particular bar allows an intro, fill or ending to be inserted at a particular bar. Fills sit on top of the basic pattern, with the limb priority control ensuring things are kept within the bounds of possibility. The Toggle Locks button allows the arrangement to be locked once you have created your sequence. Within Cubase SX, arrangements can also be saved for later recall using the Save Bank option. 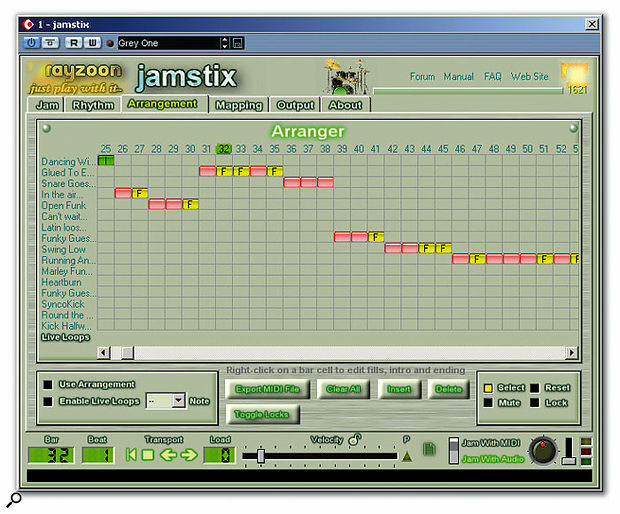 The Mapping screen allows the velocity response of Jamstix relative to the input velocity (either MIDI or audio) to be adjusted for each drum or globally. One possible criticism of Jamstix is the rather narrow range of acoustic drum samples included; while their quality and velocity response is excellent, for dance, hip-hop and electronica styles, a wider palette (such as that included with Groove Agent) is really required. However, the Mapping screen includes a Sounds panel, from where an external drum module can be selected. In essence, that drum module is loaded into Jamstix and the Jamstix performance is then routed to the drum module before being returned to Jamstix for output. As shown in the screenshot above, I tried this with Groove Agent and it worked flawlessly. This offers instant access to any other drum sounds you already have available, which is very neat. The Output screen does pretty much what you would expect. Four outputs are provided, each with its own compression controls. If you are using Jamstix 's own internal drum sounds, these can be routed to any of the four outputs within the Mapping screen, and the amount of ambience added from the stereo room mics can also be controlled from the Output screen. This is very effective in moving from a dry sound through to a more 'live' Bonham-like sound. Jamstix's four outputs all feature compression and the amount of stereo mic room ambience can be adjusted to taste. 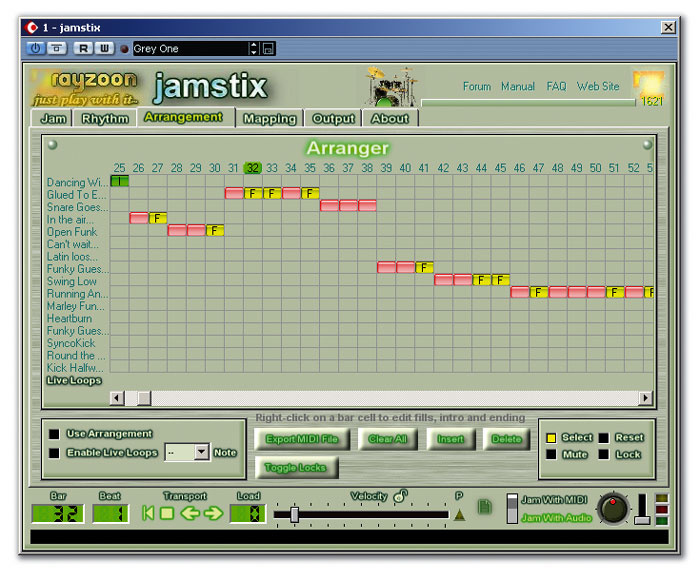 Finally, it is worth mentioning that once you have your drum sequence completed, Jamstix can output it as a MIDI file. This is useful if you want absolute control on the level of individual hits, or you need to move to a different working environment. Jamstix adopts a very different approach to virtual drumming from that offered by Groove Agent. The key feature of live response is unique as far as I'm aware, and is both good fun and very creative, although it takes some experimentation to get the best from it. Jamstix doesn't perhaps offer as diverse a range of drumming styles or sounds as GA2 and is most certainly more complex to learn, but it will occasionally surprise you by adding some distinctly human-like touches to its playing. Given the low price, for those with an interest in rock, blues and funk, Jamstix is well worth considering: download the demo and give it a through test run. Rayzoon have a virtual bass player, Jambace, in development and, on the basis of what they have achieved with Jamstix, I'll be very keen to see what that has to offer when it is released. Real-time response to MIDI or audio input has considerable creative potential. Once mastered, can produce some very convincing results. Does take some time to learn. Current sounds and styles less diverse than some of the obvious competition. Uniquely, Jamstix allows you to put the phrases 'virtual band member' and 'interesting and occasionally surprising playing' into the same sentence. Rock, blues and funk fans should check out the Jamstix demo for a cost-effective route to some new drumming inspiration.